Vividly coloured depiction of a russet coloured goat on the brink of death. The goat stands in the centre foreground, head lowered, haunches caving in, and tongue hanging out. The desert landscape in which it stands is barren. It is dominated by a range of hills in purple and pink, above which is a yellow and pink sky with a bright sun in the upper left corner and almost black clouds in the right; in contrast to the dark weight of the clouds is a rainbow, which appears in the right of the composition, at the foot of which is the carcass of a camel. To the left of the goat and echoing its inevitable fate is the skull of an ibex, silhouetted against the reflected light of the sun. The goat has been cast out into the wilderness to suffer for the sins of Man. The painting explores the Old Testament description of the Jewish ritual of atonement: "And the Goat shall bear upon him all their iniquities unto a land not inhabited." (Leviticus, 16, 22), and Isaiah, 1, 18: "Though your sins be as scarlet, they shall be as white as snow; though they be red like crimson, they shall be as wool". Wound around the base of the goat's horns is red wool, symbolising the sins with which it has been burdened. Frame: made of oak, softwood and compo, gilded; probably original to the painting; outer border of beading, then reeding framing a frieze of flower heads in roundels, with an inner border of beading. 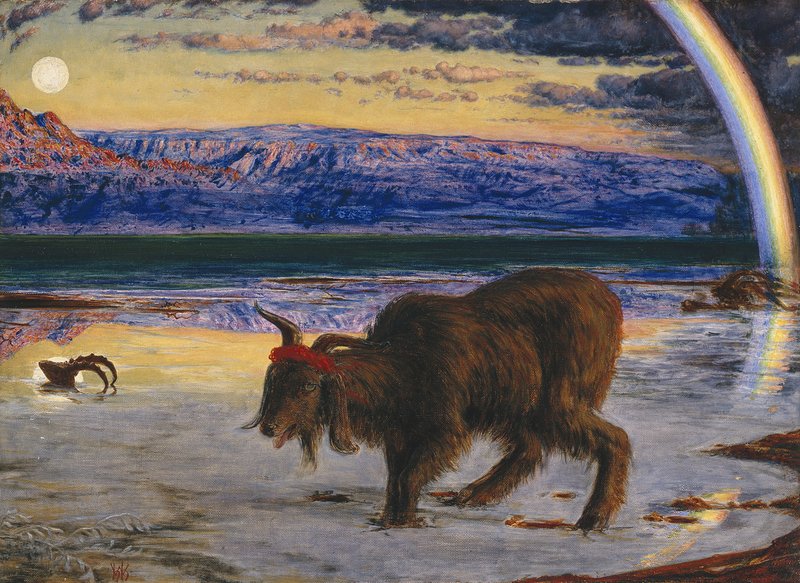 The Scapegoat 1854-5 William Holman Hunt 1827-1910 Oil on canvas Hunt began this painting on a visit to the Dead Sea. It depicts the scapegoat of the Old Testament and the Talmud, cast out into the wilderness to bear away human sins. To Hunt, this symbol of atonement also represented a 'type' or fore-runner of Christ who would likewise die for the sins of the world. The red ribbon round its head was intended to refer both to rituals in the Talmud and to the crown of thorns Christ would wear. The skeleton of a camel and an ibex tell us the fate that will befall the goat, while the rainbow offers a suggestion of hope. Ford Madox Brown summed up Hunt's achievement in transforming the mundane into the sublime: Hunt's Scapegoat requires to be seen to be believed in. Only then can it be understood how ... out of an old goat, and some saline incrustations, can be made one of the most tragic and impressive works in the annals of art.